Naomi Gafni was born in Jerusalem, Israel, has a BA degree from the Hebrew University in Jerusalem, (in English Literature and History), an M.A. degree from Columbia University, New York (in Art and Education), and an art diploma from The ‘Midrasha’ in Tel Aviv, (now part of Beit-Berl). 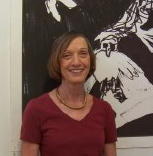 She had a long career teaching art in elementary schools, high schools and art colleges and is now a full-time artist. She has recently published two books: Mizpeh Dani, a catalogue and a children’s book bound together, (Ein-Harod Museum Publishing House), and Go To the Colors: Painting and Drawing in Creative Aging (www.eshelnet.org.il). Naomi Gafni began her career as a landscape artist. Over the years and under the influence of several Israeli artists who became her teachers, she was exposed to a variety of techniques, including printmaking. Her works include the following themes: women and feminism in Israel, landscapes as a reflection of current Israeli ideology, and the development of ‘still-life’ in Israeli art.